Veronica Kvassetskaia-Tsyglan is an internationally renowned portrait artist, featured on Bravo?s Television?s popular?Star Portraits?series. Recent notable commissions include:??Mr. Mike Maedy (CEO Canon Canada), Sonja Bata (Bata Shoe Museum), Countess Von Wedel, Bishop Michael of Canada, Steam Whistle Founders, Dmitri Hvorostovski , Measha Bruggergosman,Tom Diamond,Tanya Stepanova,Dr Draw and many more. Veronica was a First Place award Winner and Peoples? 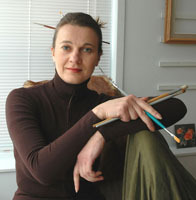 choice Award Winner at the 2002 International Portrait Festival Competition in Toronto. 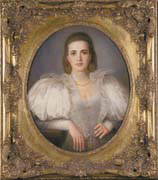 She is a member of the Arts and Letters Club (Toronto) and founder of the Portrait Society of Canada. ?Following in the footsteps of the Old Masters, Veronica values accurate drawing as an important starting point. For her, the beauty of representing the personality takes off from there, with its provision of important content information for painting. ?Veronica is an artist devoted to classical realism and dedicated her formative years to mastering drawing and painting in this genre. Over the years, she has seized every opportunity to perfect these skills, internationally:? ?from Toronto and Frankfurt am Main, to Larnaca and Moscow. Veronica has taken classes at the Surikov Academy of Fine Art Arts and studied Greek Orthodox Iconography in the Agia Mina Monastery, Cyprus. Along the way, she also earned a BA in Art History from Moscow State University. ?Veronica has exhibited at group and solo shows in Canada, Germany, and Cyprus. Most recent local venues include: John B, Aird Gallery, Imagine Art Gallery, Grimsby Public Art Gallery, St Marks Coptic Museum, Gallery 7 Yorkville, Toronto Heliconian Club, and A&l Club of Toronto. She is represented by the Bohemiarte Gallery, Montreal. 24"x 20" 28"x 20" 20"x16"